QT With the Baby Sis! I don’t get to spend much time w/ my baby sister in SL; but when we get together we make the most of it! Be it laughter, singing, shopping, movie watching, dancing or just talking in depth…I always fully enjoy the time I get with her. She’s one of the brightest stars in my sky and I’m so blessed to have her as my sister and friend. I snagged this snappy of she and I while we were hanging out because 1 – I love to show her off. She’s just that awesome! And 2 – because I actually worked really hard to look cute this particular day by picking out this awesome group gift from Artizana and matching it with my latest finds from across the grid. See? Shot on location at The Moody Cow. This is a ladies only club; voice verification required. Leaving the lag behind to a sim w/ no clubs. Nothing against clubs, mind you. 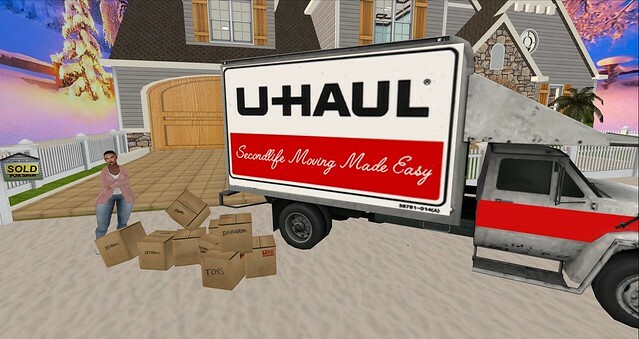 But when you’re trying to read a story to a 2-yr old and the sim lag’s got you moving slower than a constipated tortoise stuck in tar, I’m thinking it’s time to move! Soooo…we contacted our simlord and he was nice enough to relocate us! I love customer service like that. So while I’m trying to get ready for my one-to-one meeting today with my sorority I hear the movers outside ready to take us to our new home! Trying to grab my foster kid’s stuff though…I may have stubbed my toe. Welp, the truck is loaded and it’s time to head on out to our new home with new adventures! TTFN! So a group of friends and I are totally doing the latest MadPea game: The Lost Temple of the Inca Warrior! It’s been mad fun but sometimes you gotta take a break for a selfie! Just as I was about to shoot, Kairo (our 3rd and total Spider-Starer-Downer) fell to her death behind us. So while we waited…I took a quick us-sie of my girl Bubs and I looking so cute! Mertle the Turtle even managed to photobomb us and get in on the action! Mertle the Turtle totally photobombed us! Shortly after Kai made it back to us, we took on the rest of this area and handled it like the BAMFs we are! 😛 Welp off to solve more puzzles. This game is EPIC!! You must come play it if you haven’t!